Here we have taken the time to dive into the topic of how air fryers and deep fryers compare. What are their similarities? What are the advantages of an air fryer? Does the deep fryer have some advantages too? 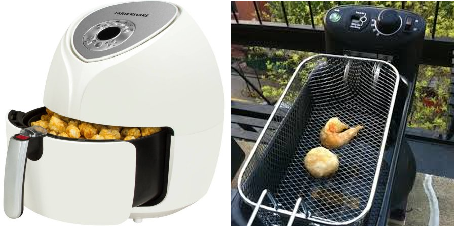 We hope this article answers all your questions on the battle of the air fryer vs deep fryer. At first glance, air fryers and deep fryers could be seen as being quite similar, they are both after all designed to cook food that is both tasty and has that fried food crunch. The method of how this result is achieved is where the air fryer and deep fryer differ. The traditional deep fryer involves sinking food into a pool of hot oil, oil that contains a lot of fat. Air fryers try to reduce the oil needed, sometimes to zero, to cook food, but still giving the desired taste and texture. The air fryer aims to achieve this by blasting the food with rapidly circulating hot air. Those with an eye on healthy eating will note the reduction in oil needed is a major benefit of the air fryer method. Both air fryers and deep fryers cater for a range of budgets. See our 5 Best Air Fryers for 2018 to see our pick of the best air fryers currently on sale. Here we’ll outline some key features you should consider during the process of deciding which to buy, an air fryer or deep fryer. Like many kitchen appliances both air fryers and deep fryers share some basic features, namely, digital screens, digital or analogue temperature controls, and an ergonomic design. Air fryers range quite a bit in price, and generally the more expensive, the more features it has. Some fryers even come with cooking pre-sets for different food types. Thinks to consider include, does it have a timer with auto-shutdown? How easy are the materials to clean? Maintenance of an air fryer is fairly simple, see our guide on how to care for your air fryer here. Deep fryers require different features, and in my opinion the most important thing to consider when purchasing a deep fryer is odor control, look for one with a charcoal filter. In a similar fashion to the air fryer you should consider how easy it is to clean and maintain the deep fryer. Given the large quantities of oil, cleaning and care is more time consuming with a deep fryer. Safety is also of primary concern with a deep fryer, consider fryers that have cool touch handles and a display window in the lid. We have previously written about the sizes and capacities of air fryers available, see it here to help you decide what size you’ll need. This is one of the big dividers in the battle of the air fryer vs deep fryer. Air fryers do typically have a smaller cooking capacity, but manufactures are addressing this issue with some now launching XXL ranges. Also, the fact that the appliance doesn’t need to hold a large amount oil, means air fryers are generally smaller in size, taking up less counter space compared to a deep fryer. We would recommend going for the largest air fryer your budget will allow as you’ll probably use it more than you expect. 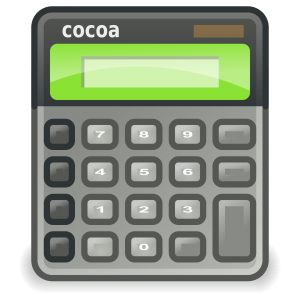 However, if you know you’ll only use it for the odd small snack, there are plenty of smaller ones on the market. A 6 cup (size) deep fryer is generally big enough for two people. However deep fryers do range in size from 2 to 12 cups. The larger ones often coming with 2 large baskets, rather than just one. Deep fryers are generally less portable than air fryers, so make sure you have enough counter space to leave it out fall time. Deep fryers aren’t considered the healthiest way to cook your food, but most of us are suckers for the food the produce. Air fryer manufacturers claim that air frying uses up to 80% less oil versus deep frying. Users of air fryers claim that the amount of oil needed is even less, some users cook without any oil at all. The massive reduction in oil used is where the air fryer gets it’s health benefit over the deep fryer. Air fryers and deep fryers are both generally low maintained and reliable. The main consideration is how easy either is to clean, and this obviously varies by brand and model, do your homework on your chosen model. Both appliance designs are well tested now, and both typically have a good life span, which is of course dependant on how often you use it, and how you care for it. Cutting straight to it, deep fryers just win here, they are generally a little cheaper than a comparable air fryer. Many recognisable brands have a decent air fryer for around $70, and given the health benefits over a deep fryer, the small cost is worth it. Worth noting is the air fryers versatility, it could be your only home cooking appliance. You can see by the recipes on our website that the air fryer has the ability to cook breakfast, lunch, and dinner. As well as being able to cook up a little treat now and again. What are Air Fryers and do they really Work? Would it be possible to get deep fryer conversations added to the conversion chart? It would be extremely helpful.